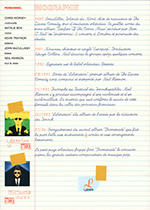 As Liberation, there are many French editions of Promenade. This is due to the fact that the album was first diffused by Virgin France, then by Labels (filial of Virgin France). As the UK press, the CD case came with an opaque tray, although most of them must have been replaced by now. 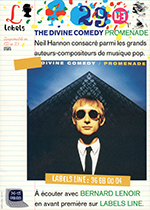 The first day editions were sold with the sampler CD Compagnon De Promenade to, but within a dedicated card sleeve. Additionally, it appears there are several first editions, different by the shades of the CD. The ‘standard’ edition has the same colors as the UK release. Another edition, let’s call it a misprint, has darker colors. This misprint also shows slightly bigger pictures, and a more blurred printing, especially for the texts. At the back, this time, there’s a Labels logo on left side of the bar code. The bar code frame is different: we have a Virgin logo and the PM number is now in a little frame ‘F:’ (F for France ?). As far as I’m concerned, I only know of the PM 527 edition. This time the CD is shiny, which means it reflects light where it didn’t on the first edition. It’s also the case for the second edition of Liberation. There’s still the same copyright mention in French, but not at the same place, and, this time, on the CD the SACEM logo has been replaced by Bel BIEM (as on Casanova and other EMI discs that followed). A French cassette release of the album does exist and is different from the UK cassette. The cassette itself features the same titles at the top, but had the Setanta copyright note also at the top. The bottom features instead French copyright notes. On the left there are ‘BIEM / STEMRA’ references as well as a ‘Made in Holland’ note (as in all the Labels release). On the right it features the EMI bar code number as well as a ‘Dolby Stereo’ logo. However it is unknown if the mastering differs from the UK cassette or not with additional noise reduction systems. The sleeve is really similar to the UK release. The bar code has been replaced by the usual EMI frame. And on the side the serial number can be spotted. Also, unlike the UK version, the second photo does not overlap the tracklisting page. The other side of the sleeve is identical to the UK version. This advert (sorry for the black & white scan) was probably part of a series of Labels’ advert for new albums. It tells us that the album was available as CD and MC, and listenable via Labels’ phone line. It also features on the back a small discography and a biography. 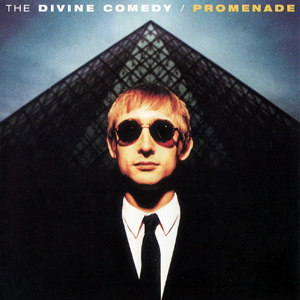 Despite the biography tells us the original band split in 1992, the line-up on the left features the live line-up circa 1993 (Neil Hannon, Chris Worsey and Natalie Box) plus John McCullagh and Kevin Traynor.